I am Bala, a Software Engineer on the EMS (Event Management Systems) Team. We create and operate the tools that help other teams launch and manage sales and deals. Our goal is to minimize the time it takes to get deals on zulily by providing efficient and easy to use tools. I started in October of 2013, so it has been a year. Although I officially joined at the end of October, I did not come to work for a week after my hire date. I had asked for a vacation for a week and I got one 🙂 I had very little work experience prior to zulily and was scared about the work culture in a start-up (which zulily was at that time). The first impression I have of zulily: this is a company I want to work for who cares about the employees. On my actual first day of work at zulily, my manager greeted me and introduced me to the team. Luckily on the very first day we had “All Hands” meeting. It was a small auditorium and everyone was gathered there and the host started calling out people who joined that week. All the new hires gathered on the dais and there was a grand welcome for us. They asked us a question: “Which Christmas Carol movie do you like the best?” Everyone was answering the question with their most liked movie name. People were shouting and clapping all the time. When it was my turn, they asked my what mine was. I wanted to steal others’ ideas as I have not seen many Christmas Carol movies. So, I made up my mind and said “I have not seen any Christmas Carol movies but I like Iron Man.” I thought people would be laughing, but it was another round of applause and screams. I loved the energy of people at zulily. This is small but something I cherish working here. One week later zulily went public and we celebrated that day in the Auditorium. I never had a chance before to experience the vibe when the company you work for goes public. It was epic. There was a countdown and people were cheering and later we heard Darrell’s (the CEO) live speech from the NASDAQ office. What a day it was! Later I was involved in talking to a lot of people from the business. I was told about the fast-paced environment at zulily and “zulily time.” I didn’t really understand it until I released a new feature for vendors called “Vendor Inventory Update Automation” in my first few weeks at zulily. After that I never turned back…. zulily has grown a lot. But zulily still moves very fast and is very aggressive. The tech team has doubled in size, there are more people you would be able to work with and the development vision has changed from “Get it out now. We can think of the future later.” to “We need to do it right and make it useful for the future.” We also have PMs to help us to define the priorities and let us code more and attend fewer meetings. I get into the office around 10am. By the time I come in most folks are here. I check my mail, look at my calendar and plan my day. I will be so engrossed in coding that I forget to eat sometimes. I generally keep reminders for that! I keep coding and attend meetings. I go back home when I feel that I have completed something concrete. I bike and bus to the office and I take the time on the bike to catch-up with what’s going on in this world. I go back home and spend some time with my family and then if I get some time I read something or else I go to bed… repeat. I agree with everyone about how much of an impact your changes and work have on the routine of the people at zulily. As I work on internal tools for zulily employees I get a chance to meet my customers directly, talk to them, get accurate requirements and build tools that cater to their needs. This kind of customer interaction is something I love about working at zulily. Also, I own what I build and I support it, which motivates me to code better. Most importantly: all the people I work with are awesome. 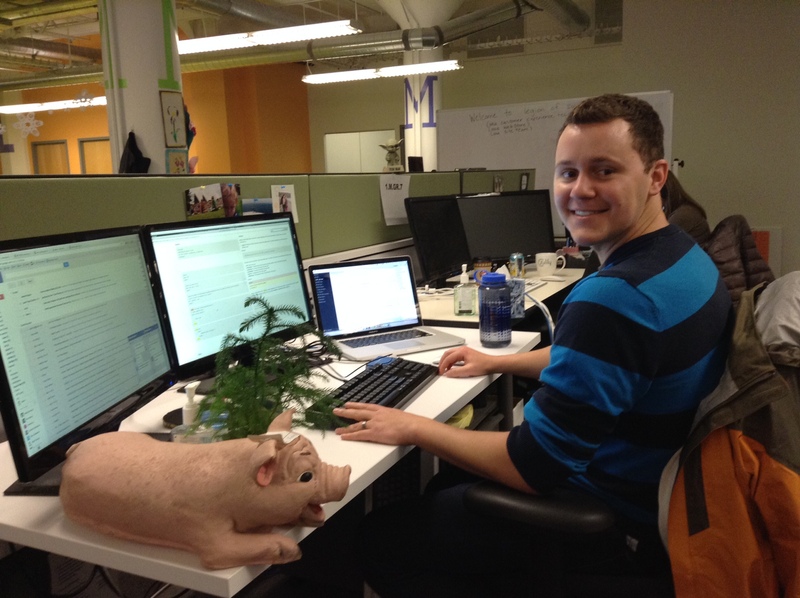 Meet a zulily Developer, Adam K.
How long have you been with the company, Adam? What is your exact role with the engineering organization? “Software engineer” but my role is geared toward frontend development. I get the most enjoyment from working on customer facing code, so they keep me on projects like that. This typically means I am innovating on current features, prototyping new concepts, or evangelizing for new frontend technology.